This example shows how to create a plot with simple drill-down functionality for the Web. 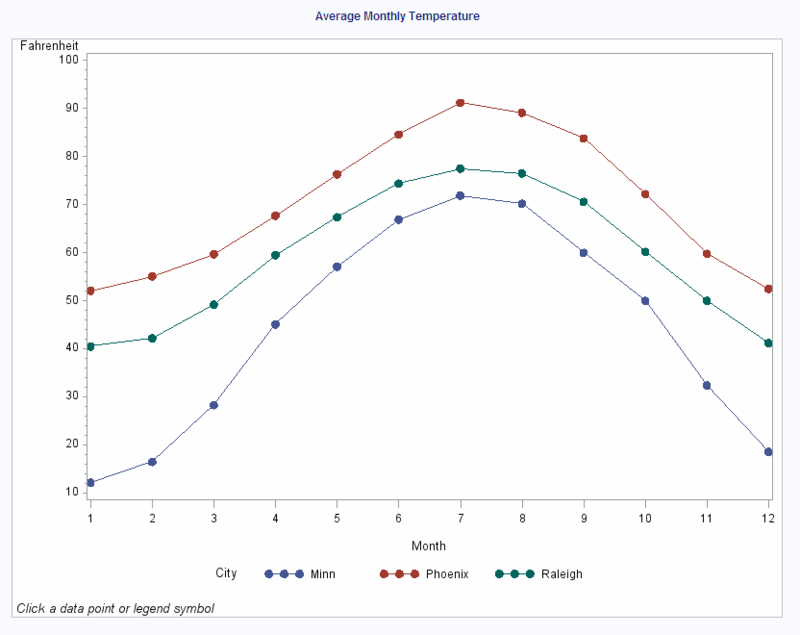 If you display the plot in a Web browser, you can select any plot point or legend symbol to display a report on monthly temperatures for the selected city. For more information about drill-down graphs, see Adding Links and Enhancements with the URL=, HTML=, and HTML_LEGEND= Options. This program modifies the code from sample GPLVRBL2, which shows how to generate separate plots for the formatted values of a classification variable. In this example, the code implements drill-down capability for the plot, enabling you to select any plot point or legend symbol to drill down to a report on the yearly temperatures for the corresponding city. The first figure shows the drill-down plot as it is viewed in a browser. The second figure shows the report that appears when you select any plot point or legend symbol that corresponds to the data for Raleigh. Open an HTML output file in ODS. Create the data set CITYTEMP. CITYTEMP contains the average monthly temperatures for three cities. Add the HTML variable to CITYTEMP and create the NEWTEMP data set. The HTML variable CITYDRILL contains the target locations to associate with the different values of the variable CITY. Each location for CITYDRILL references the file city_reports.html, which this program will create. Each location ends with the default anchor name (IDX1, IDX2, and IDX3) that ODS assigns to the target output when it creates that output in file city_reports.html. Define a title and footnote and a symbol definition for the plots. Generate the plot. Both HTML= and HTML_LEGEND= specify CITYDRILL as the variable that contains the targets for the drill-down links. The HTML= option determines that each plot point will be a hot zone that links to target output, and the HTML_LEGEND= option determines that the legend symbols will be hot zones that link to target output. This GPLOT procedure generates the first piece of output in this program. Thus, the plot receives the first default anchor name, which is IDX. Change the HTML file.The BODY= option opens a new HTML file for storing the reports for city temperatures. The new file is assigned the name city_reports.html, which is the filename assigned above to variable CITYDRILL as part of its target-link locations. The reports that are generated later in this program are all written to this one HTML file. Sort data set NEWTEMP in order by city. Clear the footnotes, and suppress the default BY line. 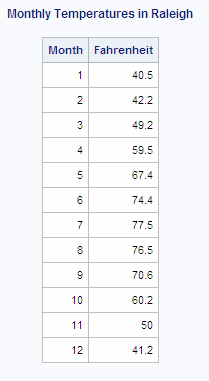 Print a report of monthly temperatures for each city. The BY statement determines that a separate report is generated for each city. Thus, the REPORT procedure generates three pieces of output. To assign anchor locations to this new output, ODS increments the last anchor name that was used (IDX) and therefore assigns the anchor names IDX1, IDX2, and IDX3 to the output. These are the anchor locations that were specified above as the anchor locations for variable CITYDRILL.